During practice Brauer had a couple of different things working for him. While spending one day on the lower end of the lake he got a couple of dock bites, one of which was a good fish. With the first day of the tournament being shortened by a fog delay, Denny made the decision to forgo a long run and stay close to the launch area. This decision was also due to the fact that he was so sore from the fall on Monday. He made a stop at a dock to see if he could get something going and his first bite was a 6 lb. 11 oz. fish. He managed to pick up three other fish fairly quick. Denny ran some other deep patterns but did not manage a bite with them, so he went back to that stretch where he had caught the first four and ended up catching 2 or three more and culling a couple of fish. That was good enough for third place on the shortened first day of the tournament and it convinced him to commit to that pattern for the next two days. “On the second day I didn’t get any more fish off of that spot that was productive on Day One, but I just kept hitting the boat docks and pitching that Strike King Premier Pro-Model jig,” said Brauer. “I wasn’t getting a lot of bites, but I was able to make the best of the ones I got.” Day Two was sunny and the wind was calm and Brauer carried a 22lb. 10 oz. sack to the scales and took the lead. The final day got off to a rough start for Brauer. He lost his first fish and really had to work for everything he got. The bass were not attacking the jig but were biting very light, which resulted in Brauer setting the hook on anything that felt at all like a bite. 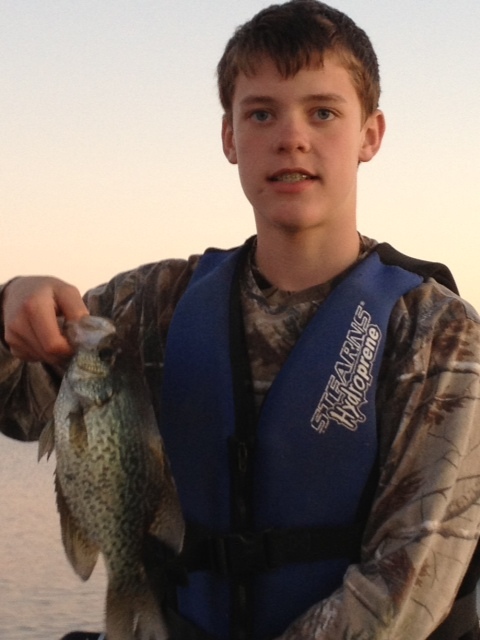 He finished the last day with a limit that weighed 17 lbs. which was good enough to give him the win with a cushion of better than 2 lbs.. 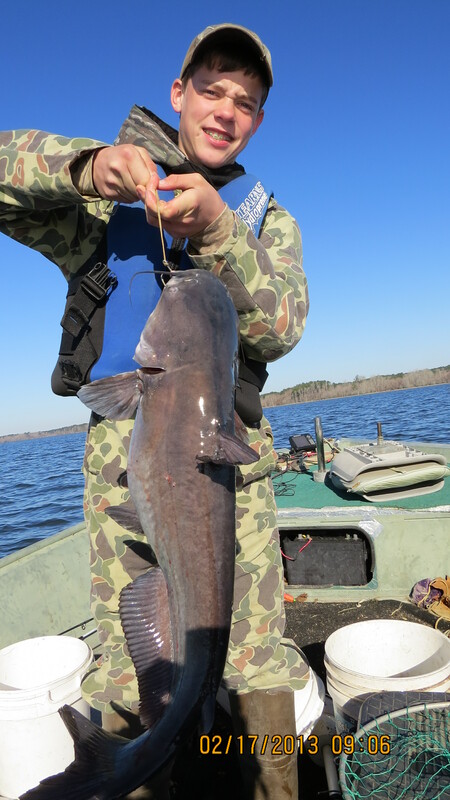 Virtually all the fish Brauer caught for the tournament came on a black/blue 1/2 oz. Strike King Premier Pro-Model Jig with a Rage Craw trailer in 3 to 10 feet of water. He was fishing the jig on a new 7′ 6″ Ardent Denny Brauer Signature Flipping rod an Ardent F700 Denny Brauer Flip-N-Pitch reel spooled with 25 lb. Seaguar Tatsu fluorocarbon line. The Everstart victory earned Brauer $27, 137 and a Ranger Z518 Bass Boat with a 200 HP outboard. Although February has been a short month, the residents of Hemphill Care Center have enjoyed a full schedule of fun activities planned just for their enjoyment. Terry McGraw and Kids brought smiles to our faces during a Saturday morning visit at which time the Kids played their string instruments and sang various tunes for us. On Sunday, February 3rd, our activity staff hosted a Super Bowl party with cold drinks and snacks. The Hope Family Clowns of Lake Area Hospice entertained us on Monday afternoon. Laughter always flows when the clowns visit. Our Resident Council met February 7th and selected Brother G from Heart to Heart Hospice as Volunteer of the Month; Barbara Blaylock as Resident of the Month; and Chere Smith and Melissa Williams as Employees of the Month. On February 12th the residents had a great time during the annual Mardi Gras party. King Cake was served, and Dwain Rhame found the baby that was in the cake. The highlight of the month was our Sweetheart Dance on Valentine’s Day. Lester Singleton was crowned King, and Berna Lloyd was crowned Queen. Residents had fun rocking and rolling in their wheelchairs, keeping time with the music. The fun began when the king and queen danced to a love song. We were serenaded by Bill Ener who sang two or three golden oldies. Our appreciations go to our February Bingo sponsors: Hemphill Church of Christ, Brother G from Heart to Heart Hospice, the American Legion Post #197, Parkway Baptist Church, and Camille from River City Hospice. We observed Presidents Day playing a game of president trivia. Other activities which made us happy were karaoke with Marti, music with the Pineywood’s Pickers, crafts with Hemphill Garden Club, and music by C.J. Michaels the One Man Band. A big thank you goes to Macedonia Baptist Church Mission Ladies for their delicious cakes and pies baked for our pleasure. Worship services and gospel singing were hosted by: First Baptist Church, Fairdale Baptist Church, Bethel Chapel Baptist Church, Community Fellowship Church, Church of Christ, Parkway Baptist Church, Antioch Baptist Church, the Church of Jesus Christ of Latter-day Saints, Six Mile Baptist Church, and Bethany Baptist Church. We extend our sympathies to the families of Bernadine Powell and Maye Davis. Happy Birthday to our residents born in February which includes Barbara Bickerstaff, Claude Strickland, Virginia Jones, and Lester Singleton. This week’s activities include our afternoon matinée and popcorn, music with Quincy from Affinity Hospice today, and the 7th Annual Chili Cook-off tomorrow. We also have Bible study with Brandi and the February Birthday Party. Family and friends are welcome to participate in the chili cook-off Thursday afternoon. We say thank you to all who helped to give us days on the bright side in February. Since October 2012, giant salvinia has been found at boat ramps on Lake O’ the Pines, Lake Wright Patman, Lake Gilmer, and Lake Murval. This has led to increased efforts by Texas Parks and Wildlife Department’s Inland Fisheries District 3A staff to inspect boat ramps for invasive plants and remove them before they can become established. Giant salvinia is usually spread unknowingly by boaters when the plants cling to their boats and trailers. A probable source of giant salvinia in East Texas is Caddo Lake, where the giant salvinia coverage is particularly high this winter. Most ramps on Caddo are currently covered in giant salvinia, and it is almost impossible to launch a boat without covering the trailer with the invasive plant. A single plant transported on a boat trailer from one lake to another can lead to a new infestation. Giant salvinia can severely limit fishing and boating access as well as displace native beneficial plants that are used as habitat by fish. Once it becomes established in a lake, it is nearly impossible to completely remove. TPWD crews have been successful in eradicating giant salvinia in some lakes when it was spotted early and confined to the area immediately around a boat ramp, but the best way to prevent it from infesting a lake is not to introduce it at all. All boaters should learn to identify giant salvinia as well as other invasive species that occurs in Texas waters. Most importantly, boaters should remember to clean their boats and trailers before leaving the boat ramp. Transporting giant salvinia, along with other invasive species, is prohibited by law and punishable by a fine of up to $500 per violation. For more information on invasive species visit http://www.texasinvasives.org or the Inland Fisheries District 3A page on Facebook, http://www.facebook.com/tpwdifmarshall. Two Tom Green County game wardens saw a vehicle attempt to run down deer in an open field. The game wardens stopped the vehicle and could smell a strong odor of alcohol on the lone subject. Sobriety tests were administered and the subject was arrested for DWI, driving with a suspended license, two local warrants and hunting with illegal means and methods. A Presidio County game warden responded to a nonfatal hunting accident at Penitas Ranch. When he arrived, the game warden learned that the hunter was trying to cross over a fence when his loaded shotgun fell from its rest and discharged, resulting in the injury. Upon further investigation, the Game Warden discovered that the 21-year-old victim had not taken a hunter’s education course, and would have benefited from the course because this very scenario is covered. During routine Sandhill Crane patrol on Christmas Eve morning, a Hockley/Terry/Yoakum County game warden happened across a pickup parked in the paved shoulder of a main highway just inside the Lynn County line. After passing the vehicle, the warden noticed a man slumped over asleep in the driver’s seat. Turning around to make a welfare check, the warden approached the driver side door and attempted to knock on the window to get the man’s attention. After several attempts of hard knocking on the window and saying, “Game Warden” even louder, the man remained passed out. Fearing for the individual’s safety, the game warden began rocking the truck side to side. After several more efforts, the man finally came to. He admitted to driving all night from New Mexico with a cup of vodka and soda to keep him company. With the assistance of the Department of Public Safety, a sobriety test was given, and the subject, who had one previous DWI conviction, was booked into the Lynn County Jail. A Garza/Lynn County game warden seized two mule deer does that had been harvested the previous day in Scurry County by a Lubbock area man. Mule deer season had ended in Scurry County, and even then, mule deer does could have only been harvested under permit. The warden met with the hunter who admitted not knowing that mule deer inhabited Scurry County. A Taylor County game warden received a call from a landowner who said a neighbor contacted him and said he saw someone with a flashlight on his property. When the warden arrived, two other landowners had the suspect blocked on a county road. The 25-year-old suspect had shot a deer on property that bordered the landowner’s property, and the deer ran onto the landowner’s land. The suspect then proceeded to track the deer approximately 400 yards into the landowner’s property, where he found the wounded deer and again shot it. A Garza/Lynn County game warden was called by a Garza County ranch foreman regarding a headless white-tailed buck that had been dumped alongside a two-track road inside the ranch. As the warden was responding to the area, the foreman called again and said that he believed it to have been shot by one of the hunting lease holders and that the carcass was no longer at the initial site. The warden arrived on the ranch, and after a short search, found the initial dump site and carcass at a second location. After loading the deer, the warden drove the ranch in search of the hunter, and later found him. The warden spoke with the man, a previous wildlife violator, at the back of the man’s truck. A severed deer head was in the bed of the truck with an incompletely-filled out tag on its antlers. The man was then led to the back of the truck, lowered his tailgate, and revealed a wasted carcass. Without provocation, “Unless you’re making hamburger, do you realize how hard it is to cut up all that meat,” the man asked. A Garza/Lynn County game warden was refueling at a Post gas station when he saw a pickup with a large white-tailed deer rack sticking out of the bed, bathed in blood across the hood and down the fenders and bed rails, pass by and immediately turn into a residential area. The warden quickly stopped the pump and followed. The truck eventually circled the block, giving the warden the impression that they wanted to parade the deer back by him. The warden saw the men act disappointed when they returned to not find the game warden, but surprised when they saw him in their rear view mirror. After checking the two men’s licenses, deer, and tag, multiple citations were issued. Afterwards, the warden asked the men why they had splattered and poured blood all over their truck. The men said that they thought it would look cool. The men also got a lesson in hunting ethics. The Roscoe chief of police contacted a Nolan County game warden after a dead deer had been propped up against the doors at the Roscoe High School. The warden located the deer and observed a clean, pass-through bullet wound on the 9-point buck. The Roscoe elementary school principal had found the deer earlier that morning and provided the warden with pictures of the deer when he found it. The deer had numerous beer bottles outlining it, a can of Copenhagen on its shoulder, and a cigarette in its mouth. The next day, the warden received information about three subjects involved. During the interview, the suspects said another man on a ranch had killed the deer and given it to the uncle of the one of the subjects. The uncle then gave it to his nephew to process. The nephew had then tried to give the deer to his peers at work. No one had wanted the deer, so the subjects decided to play a prank, and put it at the high school. The subject who originally ended up with the deer still had the tag with him. After advising the subject who had killed the deer of what happened, he was extremely upset that the subjects had wasted the meat. A Titus County game warden responded to a trespass call on a large ranch in northern Titus County. When the two hunters from the neighboring ranch were located, they admitted to trespassing and said that they were jumping ducks on the area ponds. One hunter said that they had only shot one duck while trespassing. When the warden asked for the duck, he was told that they did not get the duck because it fell over the high fence inside the deer breeder pens. The bird was recovered from the pens and discovered to be a cormorant. Citations were issued for hunting a protected waterfowl–cormorant, criminal trespass, shooting across property lines, and no hunter safety course. Can We Pretend That It Never Happened? A Rockwall County game warden checked two duck hunters on their way out of their blind. When asked to provide three shells to check the plug, one of the hunters produced two shells and a marijuana pipe from his pocket. The hunter quickly tried to take the pipe back, but the warden took possession of it. The hunter was cited for possession of drug paraphernalia, and the other hunter was cited for an unplugged shotgun. Two Polk County game wardens were patrolling for night hunting violations when they heard a vehicle roll to a stop up the road. The wardens could hear the subjects kill the truck and then one subject walked by their location. Earlier in the evening, the wardens had received a call of spotlighting in a field near their set. Due to rattling and different noises coming from the subjects’ location, wardens were concerned that the subjects had loaded a deer. After a while, the vehicle started up and the wardens stopped the vehicle up the road only to find the subject was not road hunting but stealing ground wires on utility poles. In addition, the subject had a bag of what appeared to be synthetic marijuana. One subject was apprehended, and wardens turned the subject over to the Polk County Sheriff’s Office. A Zapata County Game Warden pulled up on a night set when he observed a vehicle traveling in his direction on FM 2687. The warden hadn’t been on the set long before he saw a vehicle shining a spotlight from the road. When the vehicle approached his location, the warden saw the vehicle towing another vehicle. The two trucks kept spotlighting when they drove past the warden’s position and stopped approximately 75 to 100 yards from his position. Two individuals exited the rear truck and ran over and grabbed a buck they had just shot earlier and threw it in the back of the truck. The two vehicles were stopped shortly after, and all four admitted to road hunting. When asked what the deal was with towing the other vehicle, they said after they shot the deer, they sped off and blew the transmission. One of my favorite nuts has always been the chinquapin because of its nutty and sweet flavor. In the late 1940s my aunt Floy Richards had a large chinquapin tree in her back pasture. During the early fall, around September, I made routine visits to her tree so that I could accumulate a week’s supply of these acorn-looking nuts. The chinquapin is a first cousin of the chestnut tree, though differing in having hairy leaves and twigs and single-seeded burs. It is much smaller than the chestnut. It was fun to go to school with a pocket full of chinquapins to snack on during the school day. They were even sold in the Piggly Wiggly store at times, so that getting them directly off the tree was unnecessary. There seemed to be an abundance of chinquapin trees throughout the county. Some of the trees grew to a height of 40 feet or more. However, after many years have passed it seems that the chinquapin is no longer seen around East Texas. I have looked for a tree but have found none. The large tree in Aunt Floy’s back pasture died many years ago. There were both a persimmon tree and a chinquapin tree across the road from the Antioch Church of Christ on highway 147 north, but neither is still there. So, what has happened to all the chinquapin trees that were so abundant years ago? It seems that the culprit was a fungal infection, the Chestnut blight, which was accidently introduced to North America around 1900, probably on imported Japanese chestnut nursery stock. By 1940 most mature American chestnut trees had been wiped out by the disease. Since the Chinquapin was such a close relative of the chestnut, it was also infected. Within forty years most of the chestnut/chinquapin population of North America was devastated, with only a few clumps of trees remaining in California. Because of the disease American chestnut wood almost disappeared from the market for decades. The fungi were transmitted through the air and seemed to find a damaged spot on a tree so that they could invade the tree. Cankers caused by the fungal infection caused the bark to split and the disease to spread. Over a period of four to five years the infected tree would die. For those of you who are into botany, the fungi is called “Cryphonectria Parasitica”, so named by the mycologist William Murrill who isolated and described the fungus in 1905. All is not lost for the chinquapin lover. The chinquapin tree can still be purchased from on-line nurseries for around $25.00 per tree. They will produce their fruit within four or five years of planting. I am considering purchasing a couple of young trees to plant in my back yard. I might not be around to enjoy the nuts but I am sure that my ancestors will, and I just know that they will thank me for having the foresight to keep the chinquapin tree from becoming extinct. AUSTIN — A juvenile whooping crane was accidentally shot and killed earlier this year near St. Joseph’s Island in Aransas County, according to Texas Parks and Wildlife Department law enforcement officials. An avid freshwater duck hunter out on his first coastal duck hunt on Jan. 12 saw a bird he believed was a sandhill crane and shot it. When the man retrieved the bird he discovered that it was a young endangered whooping crane and turned himself in to a state game warden stationed in Aransas County. The game warden contacted a U.S. Fish and Wildlife Service agent, who joined the warden in investigating the case. Charges are pending in U.S. District Court. Since beginning their slow recovery from a low of 16 birds in the 1940s, whoopers have, with few exceptions, always wintered on the Texas coast on and near Aransas National Wildlife Refuge. 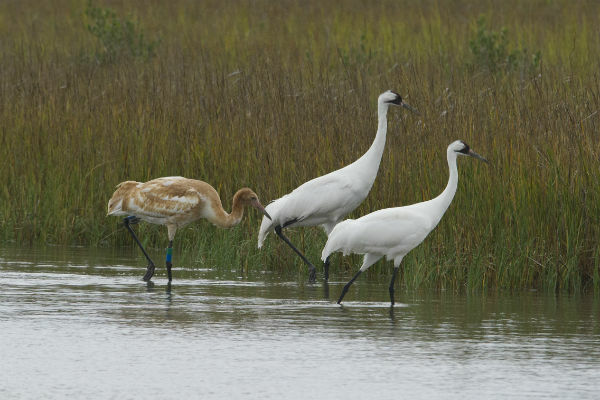 However, in the winter of 2011-12, several groups of whooping cranes expanded their wintering areas to include more coastal areas and even some inland sites in Central Texas. Whoopers usually follow a migratory path through North and Central Texas that includes cities such as Wichita Falls, Fort Worth, Waco, Austin, and Victoria. During migration they often pause overnight to use wetlands for roosting and agricultural fields for feeding, but seldom remain more than one night. 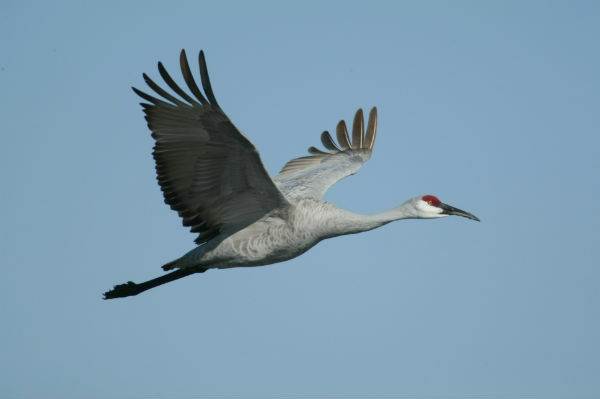 They nearly always migrate in small groups of less than 6-8 birds, but they may be seen roosting and feeding with large flocks of the smaller sandhill crane. They are the tallest birds in North America, standing nearly five feet tall. They are solid white in color except for black wing-tips that are visible only in flight. They fly with necks and legs outstretched. The whooping crane population that winters in Texas is the only self-sustaining wild population of whooping cranes in the world. The U.S. Fish and Wildlife Service is still analyzing survey data to produce an estimate for the Texas flock this year; biologists anticipate that number will be around 300 birds. This case is only the fifth known shooting death of a whooping crane since 1968, although one additional death in Calhoun County in early 2012 is still under investigation. The juvenile whooper shot in January is believed to have been one of 34 juveniles that began the migration from Canada last fall—a relatively low production year for whooping cranes in contrast to recent years. 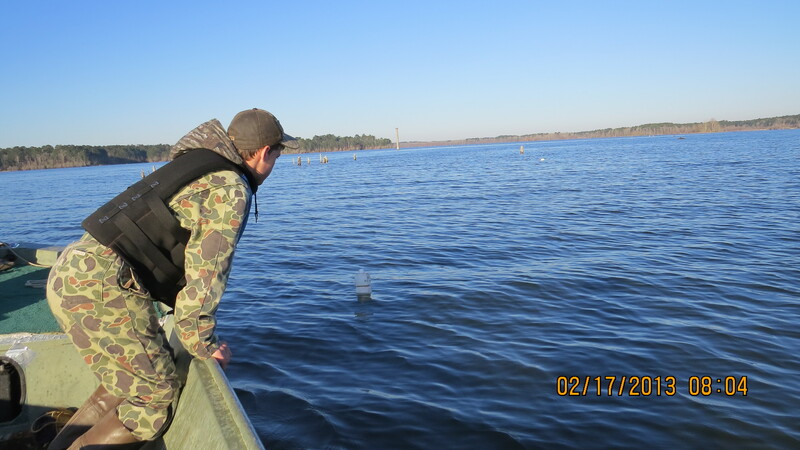 ATHENS—Falcon International Reservoir joined the Toyota ShareLunker action on Thursday, February 7, with a 13.4-pound entry into the ShareLunker program. Isaac Denson of Monahans was fishing in two to three feet of water when the big bass hit about 11:30 a.m. 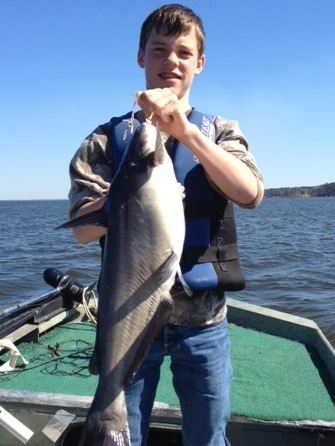 The fish was 26.5 inches long and 20 inches in girth. The fish was weighed and held for pickup at the official Toyota ShareLunker Weigh and Holding Station at Falcon State Park. Texas Parks and Wildlife Department staff from the A.E. Wood State Fish Hatchery in San Marcos picked the fish up and took it to San Marcos, where it is awaiting the results of DNA testing. If the fish is pure Florida largemouth, it will be taken to the Texas Freshwater Fisheries Center (TFFC) in Athens and held for spawning; otherwise, it will be returned to the lake as quickly as possible. The fish is the fifth entry of the season into the Toyota ShareLunker program, following entries from Lakes Austin, Fork (two entries) and Dunlap. 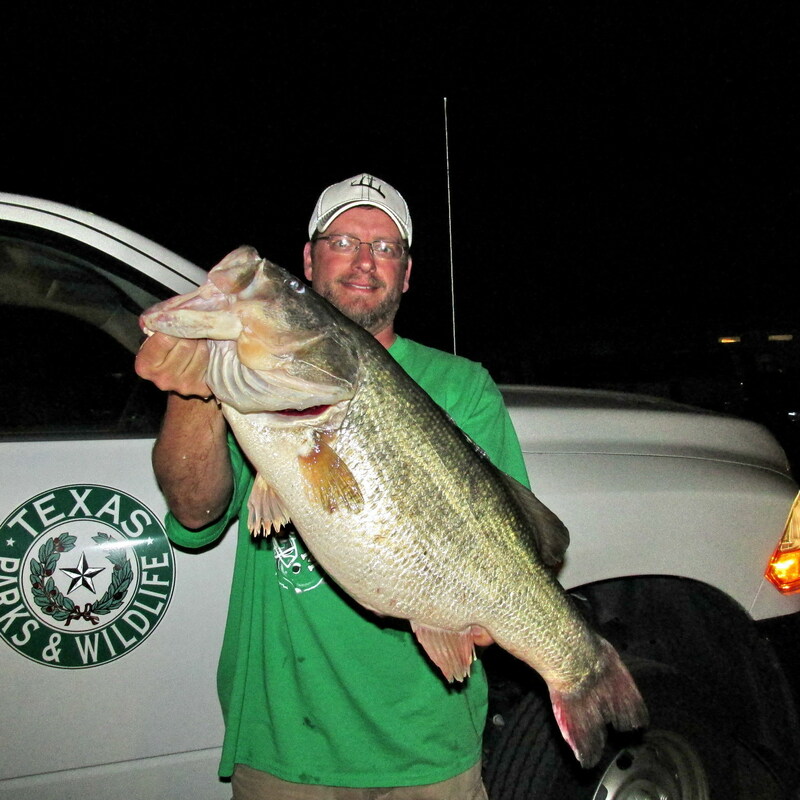 The largest entry of the season to date is Richard Scibek’s 16.04-pounder caught from Lake Fork on February 2. The angler who catches the largest entry of the season is named Angler of the Year and receives a prize package from G. Loomis consisting of a G. Loomis GLX854C jig and worm rod, a Shimano Chronarch 200E7 casting reel and a spool of Power Pro super-braid fishing line. If the Angler of the Year is a Texas resident, he or she also receives a lifetime fishing license. Anyone legally catching a 13-pound or bigger largemouth bass from Texas waters, public or private, between October 1 and April 30 may submit the fish to the Toyota ShareLunker program by calling the ShareLunker hotline at (903) 681-0550 or paging (888) 784-0600 and leaving a phone number including area code. Fish will be picked up by TPWD personnel within 12 hours. ShareLunker entries are used in a selective breeding program at TFFC in Athens. 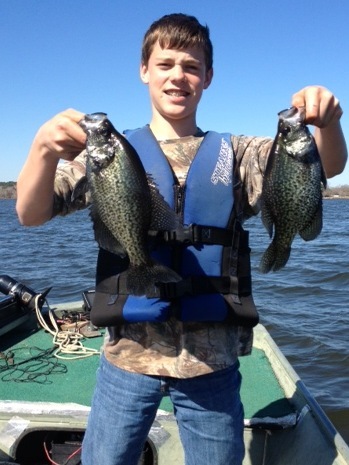 Some of the offspring from these fish are stocked back into the water body from which they were caught. Any lake producing an entry into the program receives a share of the fingerlings, whether the fish from that lake spawns or not. Anglers who enter fish into the program receive a free replica of their fish, a certificate and ShareLunker clothing and are recognized at a banquet at TFFC whether their fish spawns or not. For complete information and rules of the ShareLunker program, tips on caring for big bass, a list of official Toyota ShareLunker weigh and holding stations and a recap of last year’s season, see http://www.tpwd.state.tx.us/sharelunker. 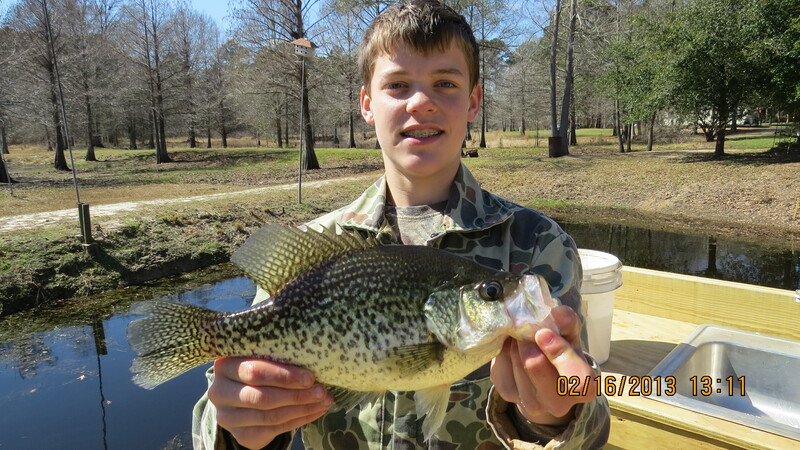 The site also includes a searchable database of all fish entered into the program along with pictures where available. 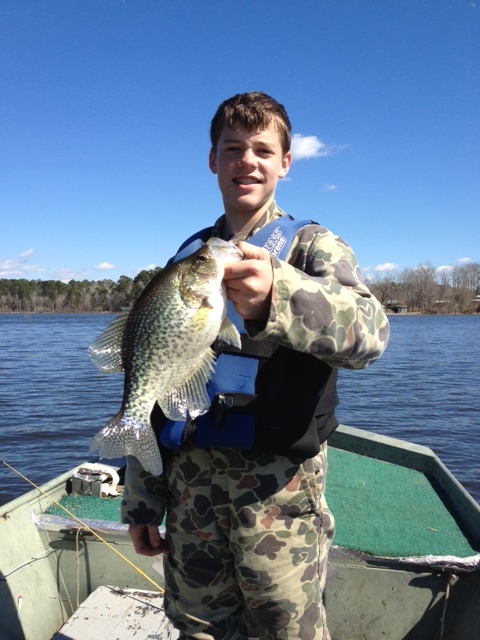 Information on current catches, including short videos of interviews with anglers when available, is posted on http://www.facebook.com/sharelunkerprogram. Money will buy just about anything in the world these days. The more money people have, the more things they can buy. Everything seems to have a price tag these days. How much money we have, determines how much we can spend. We work all our lives for a paycheck either from week to week or from month to month to provide money for our physical subsistence. But money does not buy everything. Money will not heal a broken heart or a broken relationship between friends or spouses. Money will not erase harsh words spoken during an argument. Money will not eradicate the hurt God feels when His name is taken in vain. Money will not buy happiness. For some people, the more money they have, the more miserable their lives are. Suicide takes the lives of wealthy people as well as poor people. Money will buy a house but it will not buy a home. Regardless of how elaborate a house is, it will not bring happiness to the family who dwells there. Money will not buy hope or peace. We can buy everything in the world, but hope and peace will not come as a result. Money will not buy health. People can have plenty of money to spend on doctors or days in the hospital but when it comes time for health to fail, money is no solution to health problems. Money will not buy a ticket to Heaven. No person takes a penny with them when death comes. I heard the song “Give Me Jesus”. The words “You can have the world but give me Jesus” found lodgement in my heart. Jesus is the best thing we can have in our lives. He will give us happiness, joy and peace during our lives and a home in Heaven for an eternity on the bright side.